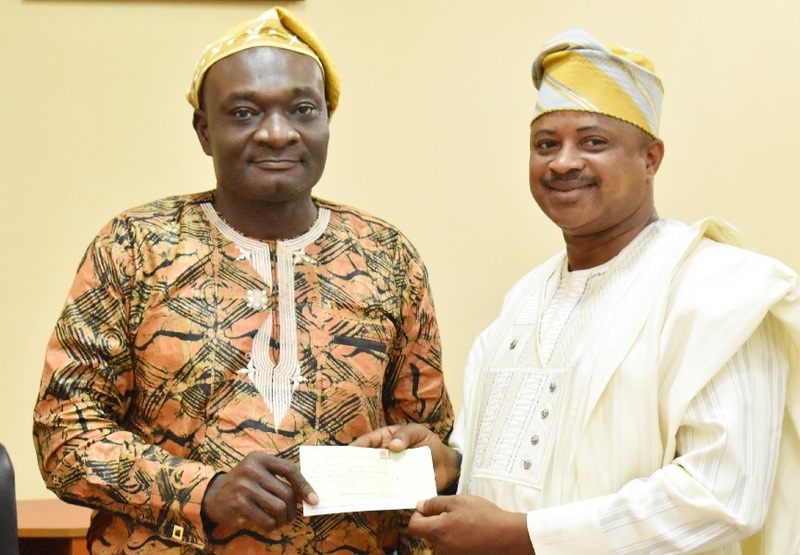 In a bid to boost the operation of the Exams and Records Unit for smooth processing of transcripts for its members, the Alumni Association of the Federal University of Agriculture, Abeokuta (FUNAAB) has made an extra donation of N500,000.00 to the University, bringing the total sum donated by the Alumni to the Unit to N1.5million. The Alumni President, Mr. Olusola Tobu, presenting the cheque of N500,000.00 to the Vice-Chancellor, Prof. Kolawole Salako during the visit. 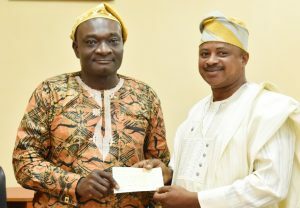 The donation which was made during a courtesy visit to the Vice-Chancellor, Professor Kolawole Salako, by members of the Association, led by its President, Mr. Olusola Tobun, also afforded the Association the opportunity to reel out the planned activities for their 21st Annual Convention and 20th Lecture Series. In addition, Mr. Tobun also pledged an additional N500,000.00 to support the FUNAAB Green Heritage on behalf of the Association. Responding, the Vice-Chancellor, Professor Kolawole Salako, commended the Association for their role in uplifting the University. He noted that with their effort, the University is gradually moving forward from where it was. Professor Salako called for more peace on campus and noted that the Management is open to all stakeholders for positive discussion.